It’s the most wonderful time of the year! The holidays always feel like they have extra warmth and joy in the air, don’t they? The fall trees drip in hues of orange and red, the smell of cinnamon lingers in the air and the warmth of hot chocolate fills your heart in light of the upcoming holidays. It can be easy to get caught up in holiday festivities – traveling to see family members, baking desserts and shopping for presents – but that isn’t an excuse to let your finances fall on the wayside. The holidays don’t need to be a financial struggle. In fact, you can make this season (and every season thereafter) the best yet with some preparation. 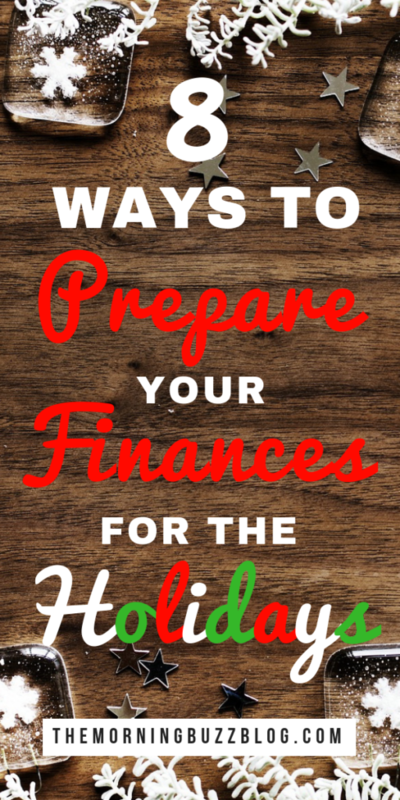 With that being said, here are 8 ways to get your finances holiday ready. Before you begin your holiday shopping, set a realistic budget and analyze your spending so you don’t end up getting into debt. 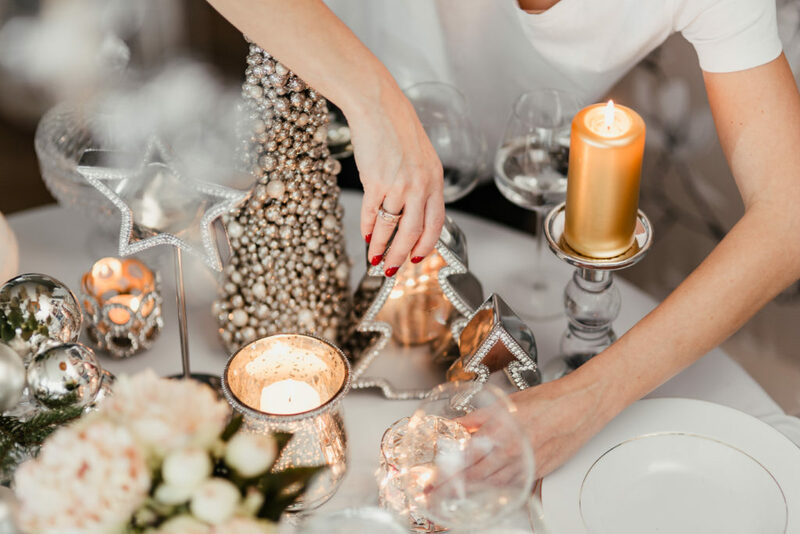 I would evaluate how much money you have available to spend over the holidays, how much you plan on spending and figuring out what you need to do to stay within your goal amount. The best way to prevent this from happening is by tracking your spending. Each day I look at my online bank statements through an app provided by my bank. I also find that having a separate bank account with a certain amount of money for the holidays helps me keep my finances in order and holds me accountable to stay within my budget. Some of the more savvy shoppers save up to a year before a holiday. The sooner you start, the more you’re likely to save because you aren’t frantic and rushing around stores hoping to find the gift you need and at a good price. If you start now, the stores will probably be fully stocked with gifts that are on sale. On the other hand, if you’re low on time, you may buy items you don’t need at a much higher price so be wary of that. Having extra spending cash will make the holiday season so much more enjoyable because you don’t have to worry as much about not being able to afford gifts or going into debt. Plus, there are so many different ways you can make extra money, especially with the internet opening so many doors for side-hustles and online jobs. Pet sit/dog walk – People will pay you to watch over their pets while they are on vacation. This can be an easy way to make some extra cash. My top recommendation is Rover, an app that connects you to a wide network of pet owners in need of pet sitting or dog walking services. What’s great about Rover is that you can set your own schedule and rates and they offer 24/7 support for all who book through their site. Take surveys – Once in awhile I’ll use multiple survey sites to make extra money. It’s a great way to earn some cash each day which adds up pretty quickly. One of my favorite rewards sites is Swagbucks because you easily earn cash by answering surveys, shopping at your favorite retailers, watching entertaining videos and searching the web. It’s free to join and you earn a $10 bonus just for signing up. ONLINE TUTORING – If you like teaching and helping people then this is the side-hustle for you. With online tutoring you could make between $14-$22 an hour depending on where you work. There are so many different apps that’ll give you cash back on your purchases. My favorite for regular online shopping is Ebates because it’s super easy to use, some stores do double cash back and you get a $10 welcome bonus just for signing up! All you have to do is find the stores you normally shop at online through Ebates and start shopping. They have every store you can think of – Amazon, Forever21, Macy’s – you name it. Ibotta is my favorite money saving app for groceries, hands down. I mean, who doesn’t love an easy way to save money at the grocery store? And here’s what I really love. Not only is Ibotta easy to use, it regularly has offers for things that I’m already planning to purchase (like milk, bread, yogurt and produce) and it only takes a couple of minutes each week to earn. All you do is take a picture of your coupon and upload it on the app – easy-peasy! So, if you’re a really busy person and are looking for a way to save money on Holiday meals, I highly recommend that you download Ibotta. It really is the easiest way to earn cash back fast before the upcoming holidays. Are there any monthly subscription services you aren’t using anymore? Whatever it is, there are things we could all cut back on which would give us more extra spending cash. Even if you can only get $50 or $100 extra dollars, that’s better than nothing, right? The sales price of an item is often not the lowest price point. A lot of times retailers will raise prices of an item and then put a sales sticker on it dropping the price back down to what it normally is throughout the year. Price match when you can so you’re getting the lowest prices on an item. Set up alerts to track items on your holiday wish list so that you’re aware of the best deals. Make sure to read the stores price-matching policies and always read the fine print. Depending on the store, some retailers will match a competitor’s price after you purchase an item and refund you the difference. Using cash for everything is hard. You have to actually think about everything you’re spending your money on. When you bring with you a certain amount of money to spend on items it’s much harder to overspend and make impulse purchases. Leave your credit cards at home so you’re not tempted to use them. It’s too easy to spend a bunch of money, forget to pay it off and wind up in debt. But, if you do end up using your credit cards, be smart about it. Use them to get special rewards and pay them off every month. Before you go, make sure to check out my free resource library to get access to a ton of freebies from weekly planners to budget printables, checklists, workbooks and more – updated weekly.